How to make a light box for under £20! This half term my theme is “Light up my life” with a focus on investigating light and dark. Whilst flicking through Pinterest for inspiration I noticed a great deal of activities relied upon the use of a light box- a classroom accessory to which unfortunately most classroom budgets just will not stretch! However, Pinterest being the wonderful fountain of knowledge that it is, it didn’t take me long to find a DIY version. I have altered some of the method slightly and I’m very pleased with the result. Cut the black bin liner into strips to match the height of the box. Open out the strips. Attach the strips all around the edge of the box so that the light will be concentrated upwards towards the lid. 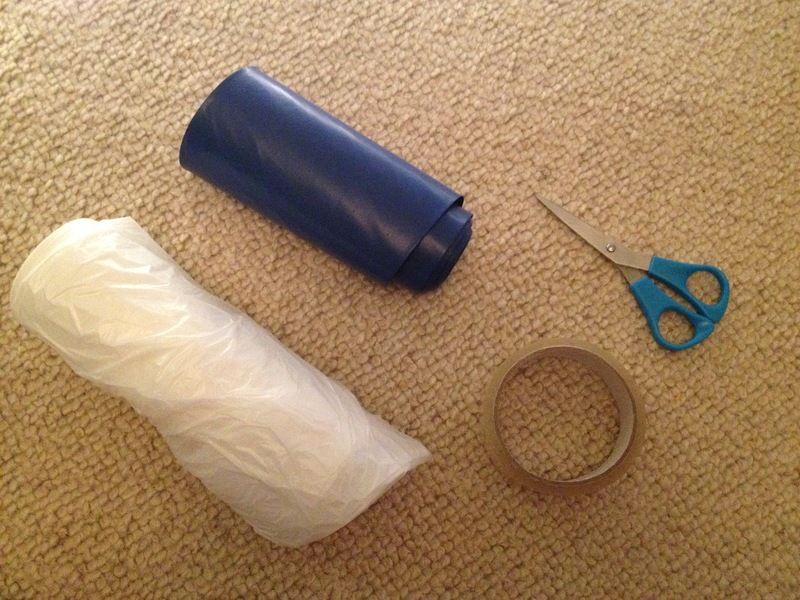 Cut the bottom off the white bin liners and open them out. Lay one on top of the other and cut both to fit the lid. Attach them in a double layer. This will allow the light to be dispersed more evenly. If you are using lights that plug into the mains, the wire can lay over the edge and the lid will still shut. Attach the lid, turn off the lights and admire your creation! I can’t wait to see what the children make of this in our dark den! If you have a go at making your own light box, we’d love to hear about it. Send us your photos and we may feature them on the blog! Time to stand and stare-does your classroom have it? It is half term week in many areas of the UK and what are the majority of teachers doing? Sitting with a cup of tea and a good book, having a glass of wine and a good meal, relaxing and switching off? Well maybe for some of the time, but if the evidence on social media is anything to go by many are planning their classroom environments for the second half of this term. I started to think about a tutor’s comments many years ago when I was on my final teaching placement. She came to visit me in my first week on placement to make sure everything was in place. I had spent hours making resources and setting up my classroom. I proudly showed her round and described all the exciting learning experiences that would be happening over the following term. When I finally stopped talking she was quiet and then said ‘that’s all great but where’s the time to stand and stare?’ She made me realise that in all my planning I hadn’t left any time for reflection, every minute was accounted for and every part of the classroom was full of stimulating experiences. Her question has stuck with me and influenced every classroom environment I have provided ever since. I believe it is vital to have a quiet area in every classroom, somewhere that is peaceful, somewhere children can think, somewhere they can sit quietly, somewhere they can take time out. I think we should always look at our classrooms from a child’s point of view. One thing I ask my staff to do is to get down to the eye level of a child in their class and take photos, it amazing how different things can look from the view of a 4,5,6 year old (the piles of clutter under the table which you cannot see are right in their line of sight!). A colleague talks about classrooms as being like ‘a chocolate box’. I love this analogy and have adopted it to describe how I want children to feel when they enter my school. I want children to come through the door and have that feeling of opening a new box of chocolates, the excitement of new learning experiences waiting to be explored. Margaret McMillan talks about ‘an environment where learning will almost be inevitable’. However as well as learning we should also think about giving children those quiet times, space to think and reflect. Tina Bruce talks about ‘the kind of environment that allows children to wallow and take as much time as they need’. 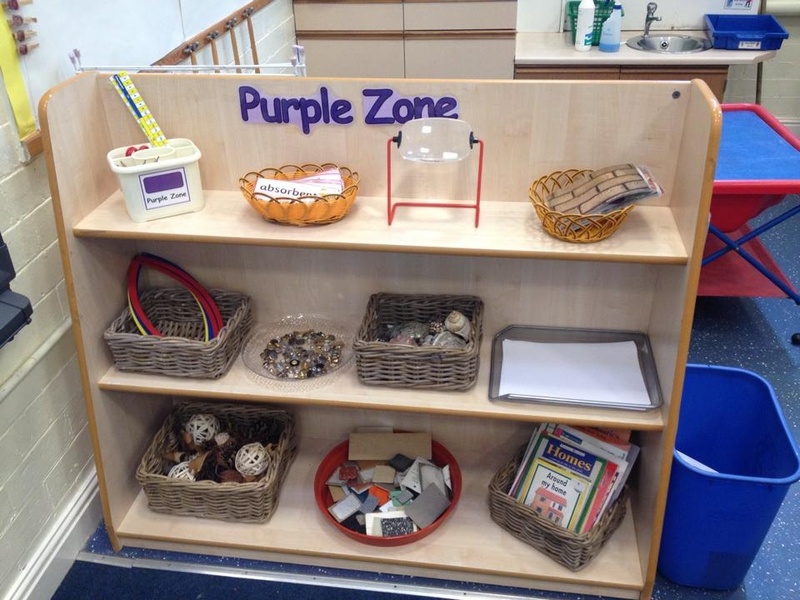 Plan a quiet corner in your classroom, a space with calming colours, cushions, small throws to wrap up in, beautiful natural objects to look at, pot-pourri to appeal to the sense of smell and allow in your busy timetable that ‘time to stand and stare’. I started the year with a group of Year 6 children who were frightened of maths and so set myself the task of making maths fun! Their Year 5 teacher had introduced Maths Monster to the children and they had really responded, solving problems for him and helping him get into Monster University by helping him learn maths. They obviously loved him because when he came back for a visit, one maths lesson, they were so excited to solve complex investigations and buy into the concept of this poor creature that couldn’t do maths. From this, I decided to adopt a Maths Monster of my own (because they’re real you know!) and along came Mark, Maths Monster’s more confident, but clumsier, younger brother. Mark often rushes through his workings and doesn’t get things right and so the children have to sort out the mistakes he makes. The children also had the idea that one of them would take him home at the weekend and do maths with him, taking photos and recording their maths in Mark’s diary. This is adding an extra layer of maths for the children and on Friday they are so eager to see who is taking him home. The maths they are doing is complex and in a real life context, such as recording how many minutes Mark was asleep, tracking the average speed on a bike ride and measuring and converting ingredients when cooking for Eid celebrations. I would recommend this, it’s great and the children initiate most of the learning so are totally invested. Alice and Mark the Year 6 Maths Monster! Are we teachers or actors? To be honest, I don’t think I fully understood what she meant by that. But this week’s events with my class took me right back to that conversation 2 years ago. Our English focus this week has been the story, “We’re going on a bear hunt.” I know what you’re thinking, “been there, done that, trekked through the grass and mud and snow.” Trust me, I know. I remember being read this story when I was in primary school. But this story is a classic for a reason. We came back from assembly and the reactions were priceless. We had shock, laughter, worry, outrage…the whole range. It was a whispered conversation between two of my more ‘streetwise’ children that made me smile the most. That willingness to use your imagination and play along is one thing that I think you are never too old for. Remember Alice’s fairy houses and role play in year 6? To get theoretical for a moment, it’s all down to the “willing suspension of disbelief.” A term coined in 1817 by poet and philosopher Samuel Taylor Coleridge. He postulated that if a writer (in our case a teacher) could incorporate a “human interest and a semblance of truth” into a story, the reader (or pupil) would suspend judgement about the implausibility of the narrative. This goes for adults as well as children. When you go to the theatre you know that those people singing and dancing on stage are playing characters and aren’t real, but you are willing to suspend reality in order to become an active player in the narrative. I believe this is SUCH a powerful tool for us as teachers. If we can get the children to suspend reality and become active players, that’s half the battle won. They then become intrinsically motivated to solve problems and try new things. The work that has bubbled out of these bear prints has been so exciting to see. The children have created wanted posters with descriptions and promises of rewards for anyone who finds the bear. My group of reluctant writers spent the morning in our construction area planning the most wonderfully elaborate traps to catch the bear and were more than happy to label them and tell me all about what they did! The small group of butterfly girls that ordinarily wouldn’t say boo to a goose marched off to the neighbouring year two classes to warn them of the dangers of the bear! Even the children who are relatively ‘street wise’ and knew it was just paint have kept schtum because they want to come along for the ride. So in answer to the title question, “are we teachers or actors?” I would say we have to be a bit of both! If we’re not willing to suspend reality every now and then (let’s face it, teaching can get pretty surreal sometimes!) and become ‘players’ with the children, how can we expect them to? I’d like to end with a thank you to my link tutor- it may have taken me two years but I finally fully understand your brilliant advice! The power of pine cones! The Power of a Pine Cone! About 3 Sundays ago I suggested an afternoon walk to my husband. He has 30 years experience of being married to a primary school teacher so his question, as he collected his carrier bag, was not ‘where are we going?’ but ‘ok, what are we collecting today?’ ‘Pine cones’ was my reply and off we went to the woods. An hour later we had 2 bags of pine cones of all shapes and sizes. Why? Because a simple pine cone can be one of the most useful resources in a classroom and it’s free! As I say to my staff, stay with me, I haven’t lost it completely! 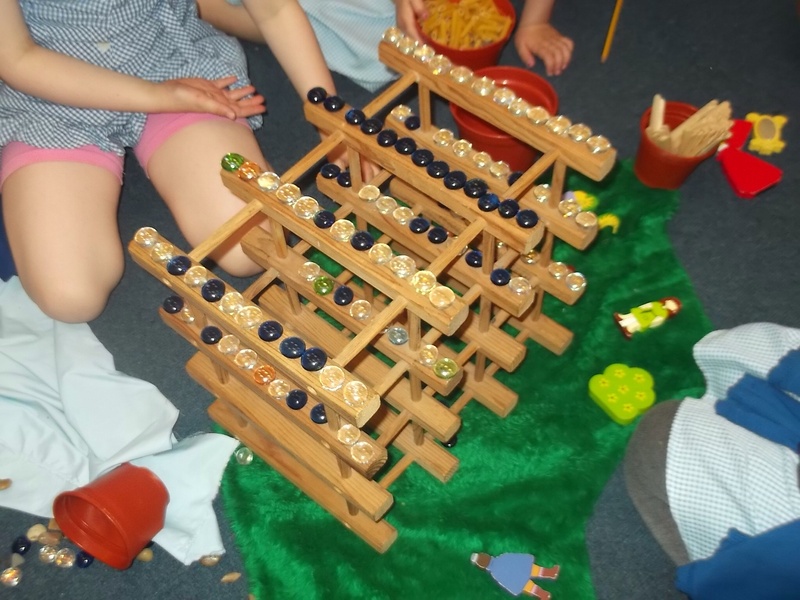 A basket of pine cones in your role play can become any type of food the children imagine, how much more creative than the bright coloured plastic pieces that are standard? Pine cones can be currency in a shop, children will work out their own denominations and values, 5 small pine cones might be worth 1 large one. Think about the mathematical possibilities! A basket of pine cones in your creative area. I have seen them turned into animals, wheels, people or just decorated for the satisfaction of adding decoration. Resist the temptation to add googly eyes with the suggestion of hedgehogs as you will end up with 30 formulaic hedgehogs and lose the opportunity for individual creativity. I think you’re probably getting the idea! Pine cones in small world will become people, trees etc. In construction they will be added to structures and models. I used my pine cones in a whole school assembly to talk about uniqueness. We marvelled at the uniqueness of each pine cone. How pine cones look the same but each one is different and amazing. This led us to think about the uniqueness of each of us, how we are all different but each of us is amazing. I gave each class a pine cone to take back to their classroom to remind them to value themselves and each other. 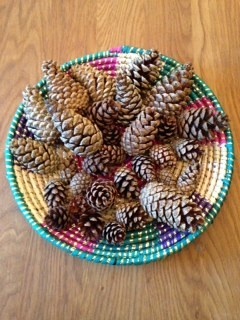 Over the last 2 weeks it has been very special to receive gifts of pine cones from the children. A little girl knocked on my office door with a pine cone wrapped up in home made wrapping paper and a label ‘To Mrs N love from A x’. She said ‘I know you like pine cones and you gave us all one to remind us how special we are so I found one for you because you are special too’. The power of a pine cone, need I say more! Oh and by the way it’s conkers this week, get your carrier bag Mr N! As a Head Teacher I have the privilege and pleasure to spend time in many classrooms across the course of a week. Reflecting today on the week gone by I felt I had to tell you about some joyous learning that has been happening in one of my KS2 classrooms. As a school, over the last year, we have been working hard to develop active play-based learning across all key stages. This has involved examining our curriculum, our environment and most importantly our shared pedagogy of how children learn. At staff meeting this week I gave a reminder of what we believe about how children learn with quotes from some of the theorists whose work underpins our approach. I have included these below. • Movement- ’thought in action’ Margaret Donaldson (1978). • Curiosity- ‘I am neither very clever nor especially gifted. I am only very, very curious’ Einstein. • Imagination- ‘Imagination is not just a cute faculty that children use to weave fantasies: It is one of the most effective tools in the learner’s toolbox’ Guy Claxton. • Creativity- ‘Creativity should not be considered a separate mental faculty but a characteristic of our way of thinking, knowing and making choices’ Loris Malaguzzi (Reggio Emilia). • Hands-on experience- ‘Playing around with materials or ideas just to see what happens is a powerful way of asking questions’ Guy Claxton. • Play- ‘In play, a child is always above his average age, above his daily behaviour; in play, it is as if he were a head taller than himself’ Vygotsky. This week in my Year 4 classroom with one of my youngest teachers who has just completed her NQT year I have witnessed all these things! 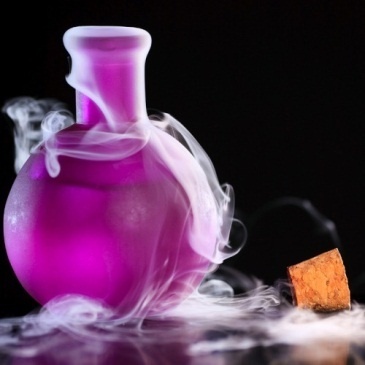 The children came into the classroom on the first day of term to find a Potions Lab all set up ready for experimentation and an Alice in Wonderland themed book area amongst other opportunities in the classroom provision. Over the last 8 days they have created potions, written spells and recipes, learnt about measures through weighing and measuring ingredients for their potions, learnt about solids, liquids and gases, engaged in role play in the potions lab, written poetry, listened to magical music, worked out prices of potion ingredients, designed potion bottles, started to read Alice in Wonderland and learnt about imperative verbs. All this in a context that allows children to move, talk, be ‘hands on’, be curious, be creative, use their imagination, be creative and most of all to PLAY. On Thursday evening the teacher transformed her classroom ready for Potions Day. The children arrived dressed as witches, wizards, Harry Potter. The staff transformed themselves into witches and mad scientists! 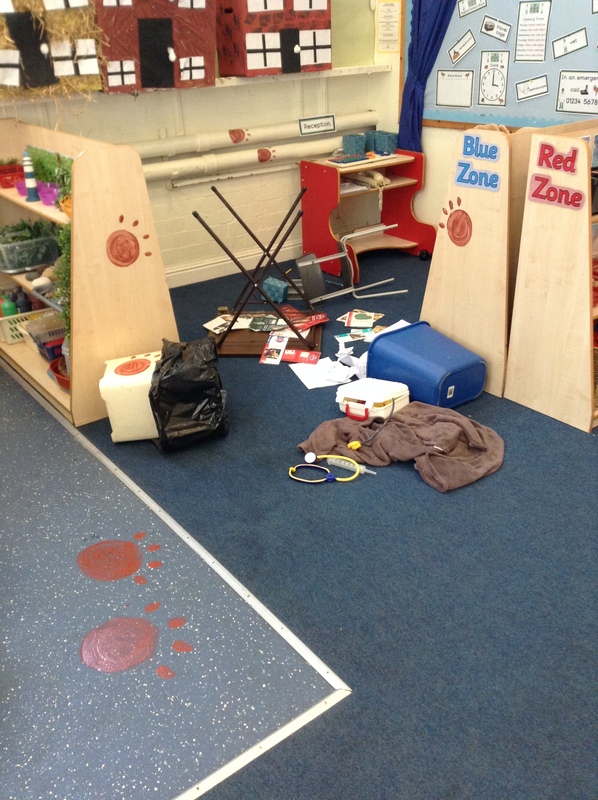 The children walked into a magical environment with spiders, webs, bats etc. Create an ‘irresistible learning environment’. Or Reggio Emilia ‘an environment that itself teaches the children’. I would challenge any adult or child to spend a day in that kind of environment without learning anything-impossible! 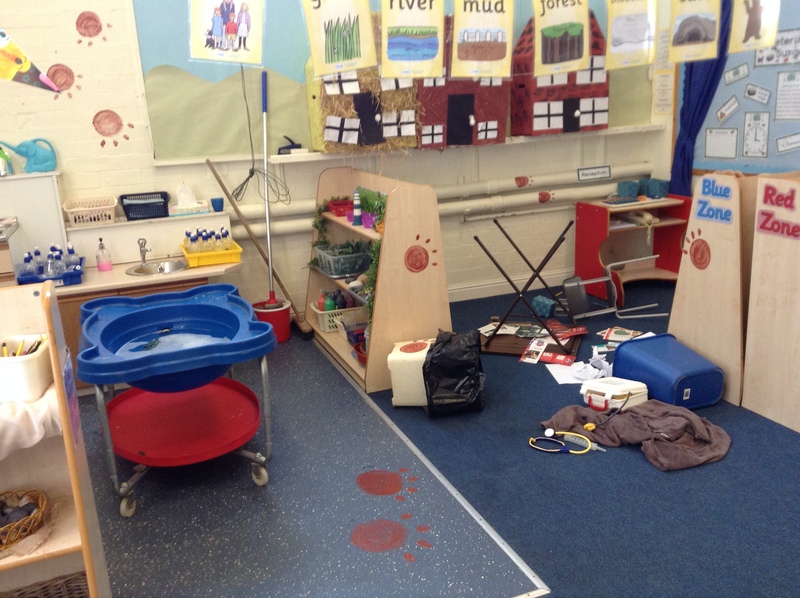 They were immersed in exciting, irresistible provocations with adults who were allowing freedom to explore, the children had time to ‘wallow’ in everything on offer. They spent the day going to the nature area to collect sticks to make wands, designing and creating potions, following potion recipes and creating edible magic wands. They brought science, maths and English work to assembly to celebrate with the rest of the school. I am thinking of putting this notice on every classroom door! CHILDREN AT PLAY-BRAIN BUILDING IN PROGRESS! When is a wine rack not a wine rack? When you give it to a class of children! No, I haven’t gone completely mad. Yes, I did give a wine rack to my class for their small world area. It came from my parents house one weekend when they were clearing out and I thought it looked a bit like a castle. That was about a far as my thinking went. I would put it out with the small world resources and see what happened. Considering that we also had a ‘proper’ plastic castle, complete with firing cannons, working drawbridge, knights with swords, I wasn’t expecting much interest. As usual, my class proved me wrong! It started with the characters living in/on it as a classic castle with some fantasy stories being told. Then it became a ‘fantasy cave castle’ complete with experimentation with patterns and glass beads. Each child that played brought something new to the story. But my favourite idea came completely child-initiated from a group of boys. I should note, these boys were the ones previously arguing over the plastic castle. 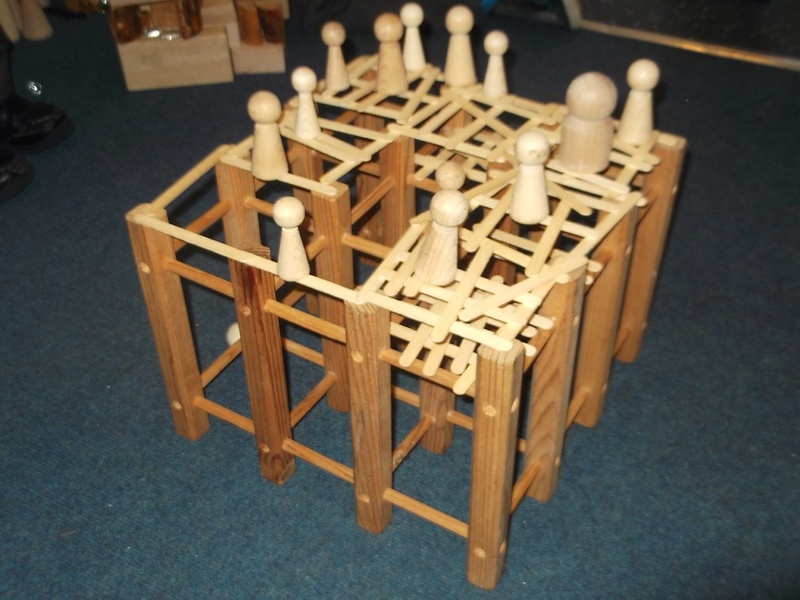 They found some wooden lolly sticks and set up a challenge of how many they could weave and balance across the beams. A fantastic opportunity to develop those fine motor skills! 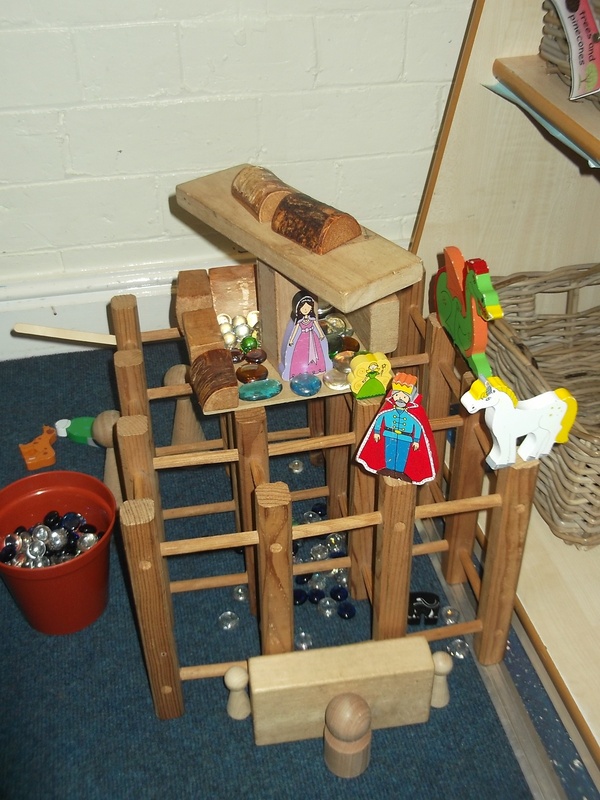 We enhanced the challenge by adding in the wooden people. How many people can you balance on the lolly sticks? Clip boards were found, tables drawn up, scores recorded, rules decided…they were hooked! They sat and concentrated on this task for the best part of the morning session. Over an hour of concentration from 5-6 year old boys is a thing of beauty. As a trainee teacher I was always taught to ask questions as much as possible, make sure they are open, make sure they are probing, sit with a group of children and guide them through their learning, through effective questioning. 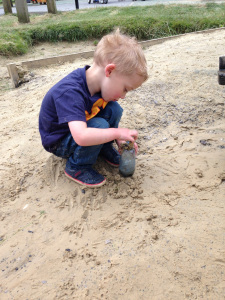 I took my son, William, to a local park where he spent an hour or more playing in the rather wet sand pit, busily putting sand into the water bottle he’d found. I was fascinated by what he was doing and went over to discuss it with him. After some rather short answers to my beautifully structured, open questions, he looked at me, sighed and said,’mummy go away I’m busy’. During my training and NQT year in year one I was warned about children ‘transporting’ (taking resources from one area to another) around the classroom and was told I need to train them to stop this as early on as possible. This means only using resources in the area that they have been put by the teacher. I have to be honest; I’ve never had an issue with transporting. Children see the world in a very different way to adults and frequently think of far more imaginative ways to use resources than we would be able to. I learned a lesson this week from a group of children about how to get the most out of an investigation area! I needn’t have worried; on our second day in the classroom a group of children changed it for me. It started with two girls laying out all the different buttons and beads on the flat stones to make a display. They then fetched the money from the maths area so that they could turn it into a jewellery shop. For the rest of the afternoon they were engrossed in sorting the beads and working out how much they should charge for them. The next morning when they arrived in the classroom they found a sign saying ‘jewellery shop’ attached to the shelves and some jewellery design sheets had been added. That morning was spent designing necklaces and labelling the various materials that they would need to make them. One little girl insisted that the beads all be threaded in a repeating pattern. So back to the maths area they went to retrieve the wooden beads and thread and experimented with different repeating patterns. At this point, apart from the enhancements I put in provision and the occasional question, there had been no direct adult input. They knew I was there to help but made it very clear that they didn’t need me- this was THEIR area now! My time to become directly involved came that afternoon. The children had found they couldn’t use the chunky shoelaces to thread the metal buttons and beads as it was too wide- did I have anything thinner? After a quick rummage in the cupboard I found blunt needles and embroidery thread. Would this do? Yes, they decided it would do. So we sat for the next hour, threading beads and deciding which of the beads we liked best and why. We priced up our beautiful creations, found the correct change to pay for them and modelled them around the classroom for all to see. Next week we will be photographing our jewellery and creating a catalogue with descriptions of the products to take for the head teacher to place her order. I NEVER would have thought of making a jewellery shop as an area of provision. But in the space of a couple of days those children have found more learning opportunities in that investigation area than I could ever have hoped! It got me thinking- would this have happened if I had told them to “put that back!”? It’s the start of the year again! NQTs up and down the country are starting out in their first teaching post and this time last year I was one of them. So I thought I would share some of what I have learned in the last 12 months. I was told this by a very good friend who was an NQT mentor. Hers was “I’m still standing” by Elton John. Mine was “ROAR” by Katy Perry. Find your song and listen to it in times of crisis. Blast it in the car, sing it in the shower, set it as your ring tone… This song will be your mantra. If you don’t have hessian display boards; cream backing paper, tacky back and whiteboard pens will keep you sane. Tacky back your working walls. When I moved to my second school this was a revelation for me! You can write directly onto the wall and wipe off again easily. No changing backing paper or laminating resources for hours! It takes some time at the beginning of the year but worth every second. Share everything. Found a great resource? Share it! Got an idea? Don’t keep it to yourself. I’m a big believer in treating others how you would like to be treated. If you were struggling with assessments or needed inspiration for a lesson plan, wouldn’t you want someone to help? Even though you’re an NQT you still have great ideas. Share them. It’s a hard year and everyone wants to hit the ground running, but don’t make yourself ill. I’m not talking about eating your vegetables, drinking plenty of water, taking vitamins, getting plenty sleep… I’m talking about really taking time to feel human. Go home BEFORE 5 o’clock every once in a while. Buy yourself a chocolate bar just BECAUSE. Keep emergency jelly babies in your cupboard. DON’T laminate that lettering that’s only going to be on the wall for a week. You are new, fresh, and full of wonderful (and possibly weird) ideas. But the weird and wonderful are usually the most memorable to the children. 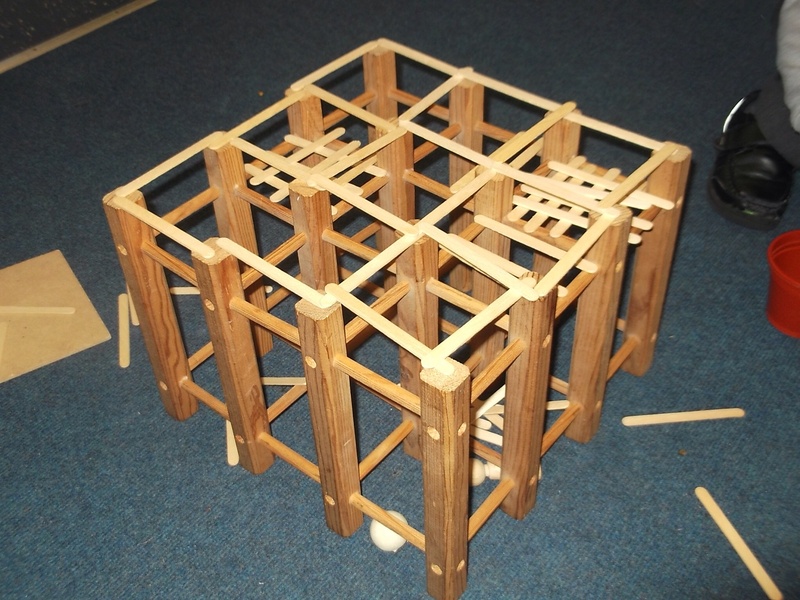 Want to build junk models in literacy? Do it! Fancy taking the children outside for a giant water/gloop investigation? Why not? Want a tiger to come to tea? YES! (All true events!) You will never get this time back again. Yes, it’s scary doing something ‘different’ that maybe does’t fit the mould. But as long as the children are safe, having fun and most importantly, learning, then have a go! You never know, you might just inspire someone. Hang out with friends that AREN’T TEACHERS. Those people who don’t use phrases like, “I need to laminate some tadpoles” or, “Well I was in the cupboard looking for a polar bear” on a daily basis. People that don’t talk in acronyms, “Sorry I can’t come out, I’ve got to place an order with YPO, update my APP, calculate the percentage of GLD, fill in the EYFSP and make a presentation to put on the IWB.” Sound familiar? Find these people and enjoy hanging out with them whilst NOT talking about “what little Freddie has gone and done again.” It will keep you functioning like a (vaguely) normal human being. …anything to keep you going when you are getting stressed and wondering “why am I doing this? !” (it happens to us all) So on a rainy Tuesday afternoon when the carpet is covered with corn flour, your sink is blocked with spaghetti, you’re coming down with tonsillitis and you’ve got an LEA inspector arriving the following morning (again, all true events! ), you have something to remind yourself why you got into this crazy profession in the first place! Mine was a poster I saw online. It simple says “Let them be little.” Find yours, print it, and keep it easily accessible for instant motivation. This might be the person who works alongside you in your year group. It could be your teaching assistant. It could be someone who works at completely the opposite end of the school to you. The point is, you know that you can walk into their classroom at any time to celebrate, laugh, cry, bang your head against a wall, or (depending on the situation) all the above simultaneously. Trust me, they are your saviour. I could go on. Your NQT year will be like no other year in your career. You will laugh. You will cry. You will plan lessons and 5 minutes in think, “what was I thinking? !” You will make amazing friends. You will eat a lot of biscuits. You will learn more than you can possibly imagine. Most importantly, you will spend a year working with the most brutally honest, wonderfully creative, hilariously funny, fantastically unique people on this earth: children. And what a privilege that is.